Including enclosed mall, Annex, Mumford Professional Centre and office towers. Halifax Shopping Centre, located in Halifax, Nova Scotia, is Atlantic Canada's largest multi-building shopping centre. The centre is operated by Toronto-based 20 VIC Management Inc. The property consists of an enclosed shopping centre with 641, 585 square feet (59, 605.2 m2) of leasable area, which attracts over 110, 000 people each week, and an adjacent property with larger format retailers and office tower called Halifax Shopping Centre Annex with an additional 419, 776 square feet (38, 998.5 m2) of leasable area, including a 53, 846 square feet (5, 002.5 m2) office tower, Chebucto Place. Mumford Professional Centre, which is also owned by Halifax Shopping Centres' parent company, 20 VIC Management, is immediately adjacent to the annex property and represents an additional 237, 084 square feet (22, 025.8 m2) of leaseable space. The centre is open 9:30 a.m. to 9:00 p.m. Monday through Saturday and noon to 5:00 p.m on Sunday. Halifax Shopping Centre is located in the west end of the Halifax Peninsula. It is accessible by car from Bayers Road and Mumford Road. The Halifax Shopping Centre Annex property stretches from Mumford Road to Chebucto Road and the nearby Armdale traffic circle. The shopping centre also includes a Halifax Transit terminal, referred to as Mumford Terminal, which is located in the Annex development, immediately across Mumford Road from the enclosed primary shopping centre building. The Halifax Shopping Centre Annex parking lot is also a designated Park and Ride location. The first public record of the Halifax Shopping Centre was filed in 1956 when Eatons applied for a re-zoning of a property which was formerly the site of the St. Patrick's Boys Home. Work on the future site of the enclosed Halifax Shopping Centre site began in February 1961. The centre was developed by Webb and Knapp (Canada) Ltd. It was designed and engineered by staff members at Webb and Knapp in consultation with The Graham Company and Associate Architect Gregory Lambros. Anglin-Norcross Maritime Ltd. served as general contractors on the initial construction. The Thursday, September 13 edition of The Chronicle Herald included a thank you from Halifax Shopping Centre’s owners, by Triton Ltd., which estimated the opening day crowd to have been 27, 000 people. In 1989, Halifax Shopping Centre was expanded to include a food court, an additional 75, 000 square feet (7, 000 m2) of retail space and three parking decks. 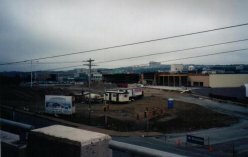 In 2001, Halifax Shopping Centre purchased and renovated the former Sears store and surrounding land adjacent to Halifax Shopping Centre, boosting total leasable area to over 1, 061, 361 square feet (98, 603.7 m2). The redevelopment was renamed Halifax Shopping Centre Annex. In 2007, Halifax Shopping Centre underwent a major renovation to update the enclosed shopping centre, its decor and way-finding structures.